Cinema Musica: Since 2004 the IFMCA annually announces best achievements in film music composing. How much gets the IFMCA Award recognized in the film music business/in Hollywood? Jon Broxton: A fair amount. We generally get recognition from the trade papers, we have our press release picked up by the news feed in the Internet Movie Database, and many of the agencies and publicity companies who represent composers list IFMCA wins and nominations on their clients’ biographies alongside Oscars and Golden Globes, so I like to think that means they hold what we do in pretty high esteem. We get picked up by a lot of the Awards tracking websites as precursors to the Oscars, and we get some healthy discussion there, which is nice too. It could be better, of course, but we are still a comparatively young organization, and these things take time. Besides getting publicity, are there other forms of ‘feedback’ to what the IFMCA does? One thing I am especially proud of is the way that an IFMCA nomination has subsequently positively affected certain composers’ careers. I also know that, in Europe, several of our nominees were featured in major newspapers, on culture and arts television shows, and even on the national evening news as a result of their nomination from a “Hollywood” organization, and that their careers in their home countries have taken an upward swing as a result. It’s this sort of thing which really makes everything that we do worthwhile. I don’t necessarily think that the IFMCA has any real power to change a certain composer’s life or career, but when you do hear about success stories like this, knowing that the IFMCA played a little part in that is immensely gratifying. Does the award simply want to show the recognition of film music fans or do these awards aim for a more serious purpose? Well, I think in the first instance, we want the whole thing to be fun. It’s a celebration of the best in film music, a genre we all love, and all the banter and discussions and back-and-forth on the various fan message boards is part of it. However, I think we have a more serious purpose too. The members of the IFMCA are not just film music fans. We all started as fans, but over the years the people who are now in the IFMCA have become some of the most well-respected writers of serious film music criticism in the world. Not only do we have members who run the most popular film music review websites, and write for the most popular film music magazines world-wide, but we also have members who run very popular radio shows, as well as others who are involved in organizing the world’s major film music festivals, like the ones in Spain, Poland and Belgium. Beyond that, I think we all feel that film music in general, despite it being much more mainstream these days than it used to be, is still a little misunderstood. It’s under-valued by both the public at large, and within the wider film industry, and if we can do anything to help redress that balance, we will. We try to acknowledge the film composers who often work exceptionally hard and under extremely difficult circumstances in terms of time and budget and give them the respect they deserve, but far too often don’t get. I also think it’s significant that composers are the only major technical group working in Hollywood that doesn’t have a guild. Directors, writers, cinematographers, editors, sound guys, they all have guilds, and have annual get-togethers where they hand out awards for excellence from within their own peer group. The Society of Composers and Lyricists in Los Angeles doesn’t have an award ceremony at all, so I’d like to think that we have sort of positioned ourselves as a cross between a ‘composers guild award’ and the Critics Choice Awards, as an award for excellence presented by people who actually care very deeply about this music. Do you think the award won or lost its significance during the last years? How do you measure this and how important is it to you? I think it has gained significance over the years, for sure. Each year the number of composers who are submitting works for consideration, who spend time and effort putting together promo packages for us, is increasing. The amount of composers who make a big deal about their nominations and wins, who are actually waiting for the awards to come out, is increasing. As I said before, we see our awards being listed on official composer bios coming out of Gorfaine Schwartz and Kraft-Engel, some of the biggest agents for film composers in the world. The IFMCA wants to be in close contact with film music composers, right? To judge on film music and with this on the work done by those composers, there is always quite a high conflict potential present. How free is the IFMCA in its role as a jury for film music achievements? Completely free. Of course, each member will always have their own personal bias of what they judge to be the best music, and have preferences for a particular type of score and a certain way of writing, but in terms of outside influence, there is none at all. Every member votes entirely based on their own personal judgment of each score and film. The IFMCA Awards are presented after the Golden Globes and the Oscar nominations. Quite often their nominations and winners resemble film music main stream. Is it possible to stay unbiased? I think so. We do try very hard to keep an open mind and judge each score fairly and on its individual merits. Looking back at some of our recent Score of the Year nominees, I think it’s highly unlikely that the Academy would have recognized a score like Mark McKenzie’s The Greatest Miracle or Christopher Young’s Drag Me to Hell, and I’m very proud that we did. Having said that, when it comes to the Oscars and Globes, I think one of the things we critics don’t always like to admit is that the voting committees there sometimes get it right! But, for the most part, I don’t worry about things like our nominees or winners matching with them at all. If anything, it’s nice when they agree with us because it means they got their nominations right and awarded the right scores. Besides, the two nomination processes are usually on-going at the same time as each other, so it’s quite difficult for one to influence the other in any significant way. The IFMCA is often criticized for being too much focused on the output of big Hollywood composers (main stream). For right or for wrong? It’s a little bit of both, I think. The problem, of course, is that you can really only vote for what you have seen and what you have heard, and all of us are much more exposed to big Hollywood blockbusters and studio tentpoles. All of us are going to listen to the latest James Horner or Hans Zimmer score just because that’s what we do; the challenge is then to actively go out and find the little gem scores that get no publicity and are by composers who have much smaller profiles. But we do go to great lengths to try to identify the best music across the world each year. We have a network of regional co-ordinators from within our membership whose job it is to keep an eye on their own local film music industry and make members aware of the best their country has to offer – getting promos from local composers, recommending certain titles, and so on. And, by and large, they do a stellar job. We have music coming in from Spain, from Italy, Poland, Germany and across Scandinavia, and we do often nominate scores from small films that never come anywhere near multiplexes. Just last year, for example, we had a TV score from Spain, Isabel, by Federico Jusid, which came in and blew everyone away. The same with the feature documentary score from Finland, Metsän Tarina by Panu Aaltio, which ended up taking home the award. A couple of years before that we had a TV score from Poland, Czas Honoru by Bartosz Chajdecki, which was similarly well received. But naturally we do still have a few gaps in our knowledge base. I would love to have a member from eastern Asia who can recommend all the best stuff that comes out of Japan, China and Korea, and our knowledge of Bollywood and the Indian film music industry is virtually non-existent. I would like to change that in future, if possible. I also want a member whose specialty is in the world of video game scores – it’s such a rapidly expanding genre, and so much great music is being written in that world, but it’s difficult to know what to focus on. On the other hand, we’re not going to exclude something from consideration just because it’s mainstream. Some of the best film music composers in the world work in Hollywood, and if the best music of the year does genuinely come from a mainstream Hollywood production, then we’re going to vote for it. But we really try very hard to judge every score equally, and often it just so happens that the IFMCA consensus is that the John Williamses and Danny Elfmans of the world really are writing the best film music in the world. I wouldn’t want to change that just for the sake of appearances. Do you think it is important that all the jury-members have the same taste in film music to show yourselves as a strong, compliant team, or is it on the contrary important to have as many different opinions as possible? No, I think it’s very important that we have as much diverse taste as possible. Each member brings their own unique perspective to the group in what they consider to be examples of excellent film music, and they are able to put their cases forward to other members when it comes to recommending scores to vote for. But doesn’t this recommendation possibility come with the danger, that so called “leader reviewers” can manipulate other members effectively? I too read the messages on the IFMCA board and am glad for getting recommendations but focusing on those recommendations would mean to maybe miss out on other scores. But musical taste is such a subjective, individual thing… Wouldn’t a voting process without ongoing discussions about the eligible music be more “honest”? No, I don’t think so. All our members have enough intelligence and integrity to make up their own minds about the music they feel is the best. I don’t think recommendations from “leader reviewers” make any difference at all, except for the awareness aspect. I personally think that the recommendation process is invaluable in ensuring that we are aware of scores for films that aren’t released outside their domestic markets. Earlier I mentioned Isabel, Metsän Tarina and Czas Honoru, two TV scores and a documentary movie, none of which were broadcast or shown outside the country in which they were made. Without the work of our members in Spain, Scandinavia and Poland bringing them to the attention of the rest of the group, we would likely never have known that these outstanding pieces of music existed, and never would have been able to vote for them. Would you agree that since your award exists, the awards were given mostly to melodic, orchestral scores? Having a look at the list of the winners, one could think that more experimental works have hardly any change to win at all. What do you think? I think that’s just a by-product of who we are, and what our musical histories are. From a personal point of view, yes, that is where my own musical taste lies, because that’s the sort of music that brought me to film music in the first place. I have always felt that, in most instances, emotionally strong music with melodic elements and varied instrumentation is what best helps support a film in communicating with its audience. I know that many people don’t agree with me, and that’s OK. But a lot of our members come from a similar background as me, having grown up with Williams, Goldsmith, Elmer Bernstein, and all those other greats. But I don’t think any of our members would outright dismiss more experimental works as being inferior, and some of our nominee choices confirm that. In the past couple of years we have nominated Sinister by Christopher Young and Drive by Cliff Martinez, which are about as far away from melodic orchestral scores as it’s possible to be. Isn’t it rather unfortunate that there are quite a few people in the jury who work for labels to release scores on CD? Speaking of this, your honorary member is one of the busiest CD producers. Don’t you see a controversy here? No, not at all. Mikael Carlsson’s honorary membership was purely a professional courtesy to recognize the fact that he was the person who originally initiated the idea of the IFMCA in 1998, when it was called the Film Music Critic’s Jury, and when he was heavily involved with Music from the Movies magazine. Without Mikael’s inspiration and leadership there wouldn’t be an IFMCA at all today, and we simply wanted to acknowledge that. Mikael doesn’t vote in the awards, so although he is the owner of Movie Score Media, he has no influence on whether any of the scores he releases receive votes. As for the other members, we have an informal policy whereby any members who also work for record labels do not vote in categories where they have a vested interest, so it has never been an issue. Where do you want to head with the IFMCA in the future? Firstly, I want it to be about more than just the awards. Being in the IFMCA has to be beneficial to its members too, so I really want to make being an IFMCA member an attractive thing for people who write film music reviews – a place where you can discuss relevant topics with peers, where you can come for support and information, to share ideas, and so on. A real community. I also really want our website, our Facebook portal and our other social media feeds to become much more lively, so that our members can advertise their reviews and radio shows to a large audience, to build up their readership, get more hits, and so on. Secondly, I think I would like for there to be more innovation in future. The IFMCA Radio broadcast we did last year seemed to be really popular with people, and so I definitely want to continue on with that. I’ve been mulling over a lot of ideas about other things we could do – a YouTube channel, video footage of the awards being presented with recorded messages from the composers – which I am thinking about proposing soon. I also want the IFMCA to have a much more public face, and take part in more events under the IFMCA banner. Some of us were part of the Krakow Film Festival in Poland a couple of years ago, where we led a discussion panel, and I think that was a really exciting step in the right direction. For a couple of years we have been in contact with the organizers of the Cannes Film Festival, trying to initiate an in-competition film music award there, but we have hit snags there in terms of funding and sponsorship, so that hasn’t happened yet, but that would be a real coup for us if and when that happens, and would increase our profile enormously. I guess, the bottom line is that I want for us to be seen as something positive for both film music journalists and for composers; providing a useful community-based resource for those of us who are actively involved in film music journalism, and acknowledging the best film music being written across the world each year in a way that composers respect. 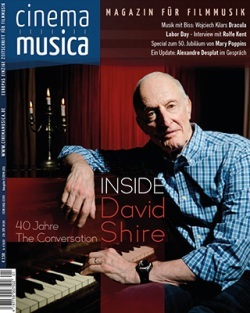 You can purchase the issue of Cinema Musica containing this interview by clicking here. With many thanks to Stephan Eicke.